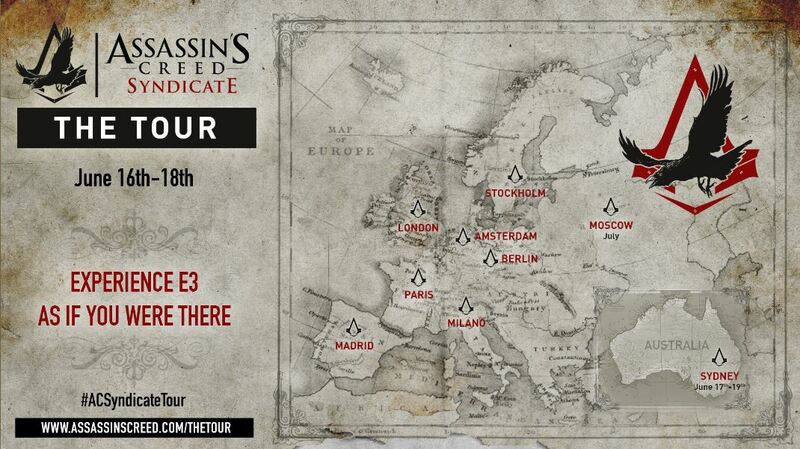 If you live in Europe, Russia or Australia and can’t make it to E3 2015 to sample the delights of Assassin’s Creed Syndicate, don’t worry, Ubisoft have you covered. Set to kick off onJune 16th, Assassin’s Creed Syndicate: The Tour will allow players hands-on time with the game which is set to release later this year on PC, Xbox One and PlayStation 4. Assassin’s Creed Syndicate is set in inudstrialised Victorian England and has the world’s favourite band of righteous, stabby folk attempting to undo a conspiracy to control the world. Players can register and book a place on the for free here, while the handy map below shows all the places that the tour will take place.